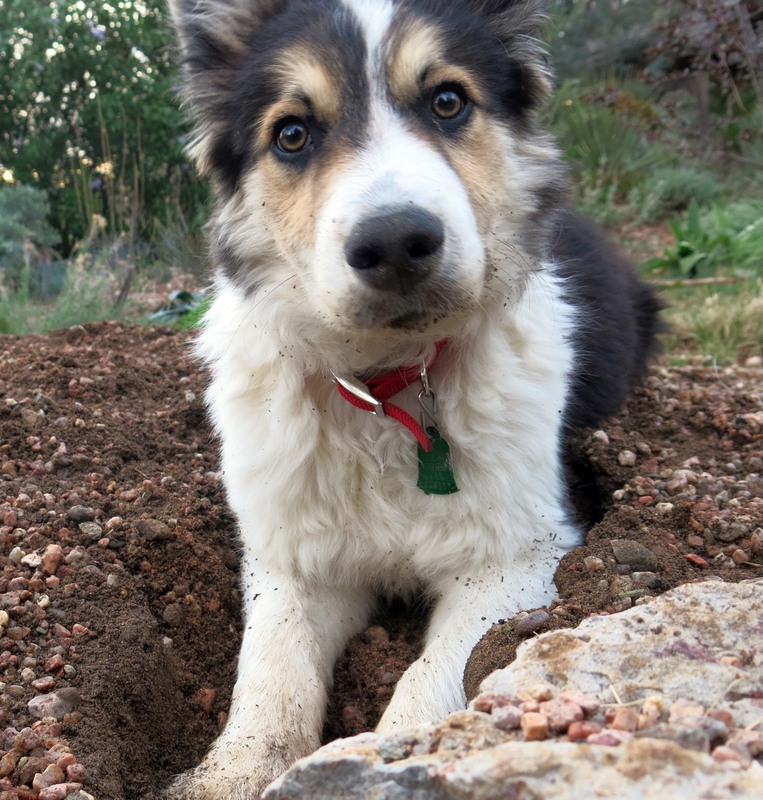 Greetings and salutations, everyone; yes, once again it is I, Mani the rather small purebred border collie, filling in for the guy I live with, and here to bring you the latest news from our garden. You may remember me from such posts as “Helping In The Garden”, among at least a few others. Here I am in a characteristically horticultural pose. “Trying not to be seen”, according to the guy I live with. Pretty humorous, huh. 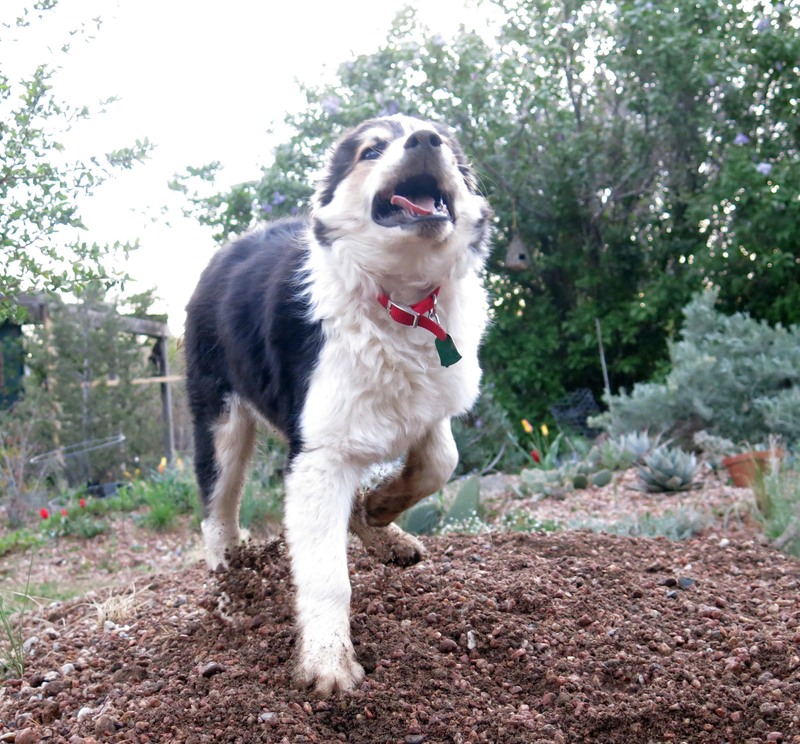 We purebred border collies do have a light-hearted side. The guy I live with says I’m mostly very earnest about the things I do, so you’re lucky to see me in this delightfully impish pose. 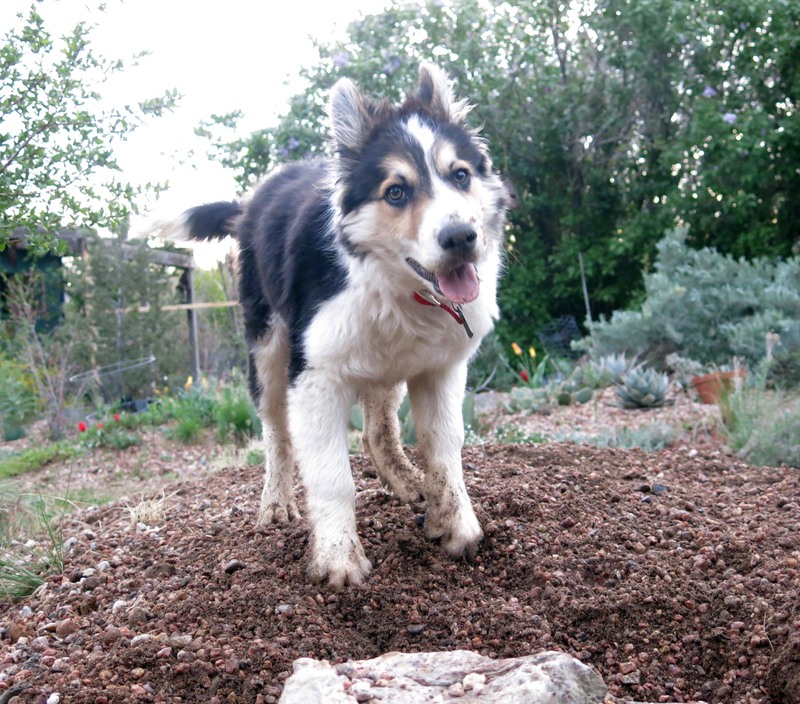 If you looked closely, I mean like trying to find me, you may have noticed that there’s a new fence around the rock garden, which I hear is called “Mount Zot”, for reasons I don’t understand. He tried to explain it to me but I lost interest after the first fifteen minutes of listening to him talk. Here’s the new fence again. The guy I live with says it’s “putrescently hideous” but I just find it annoying. 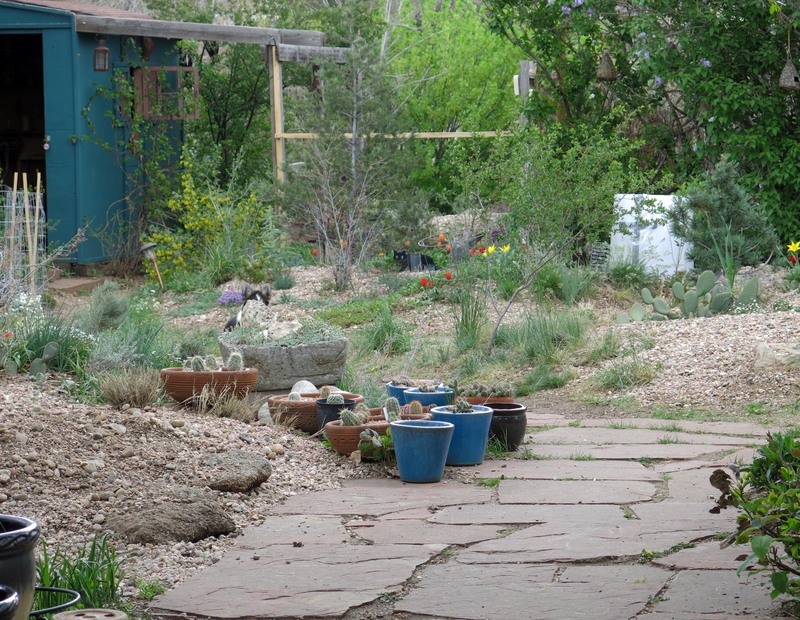 I liked to sneak into the rock garden and then have the guy I live with come running out of the house waving his arms and shrieking in some “girly-type” voice (according to him) because he says it’s all I pay attention to, but, really, I don’t pay any attention to him at all. Well, here it is again. This time from farther away and with an ornament. You can also see that the native cool-season grasses have turned green and are growing, in what passes for a “lawn” here. The paths are dirt, because we can have dirt paths here, and so we do. So anyway, that’s the new fence. Hideous though it may be. You see that gravel over to the right, there? That’s a pile of pea gravel, sandy loam, and then some “river rock” on top, and there’s nothing planted in it. It’s just there. Keep that in mind for a minute, will you? In the mean time, it rained some. 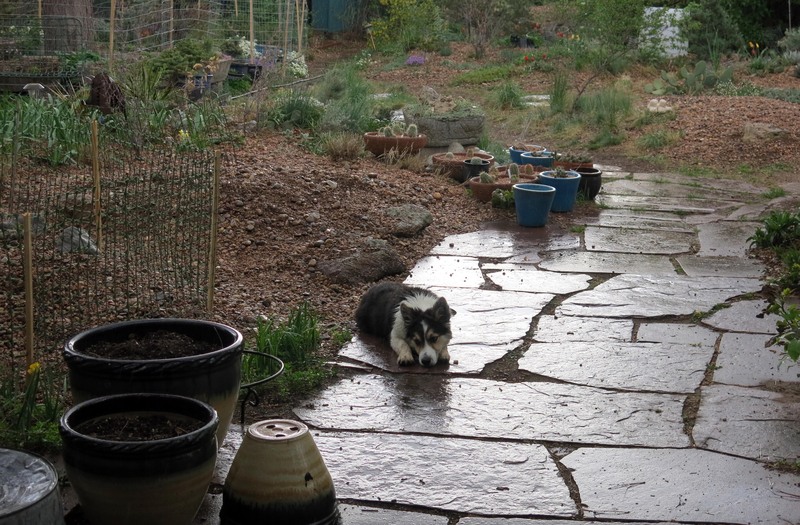 I lay out on the flagstone, because I had a plan, and getting soaking wet was part of it. I know it looks like I’m sad, but really I was planning. I got soaking wet. It was excellent. 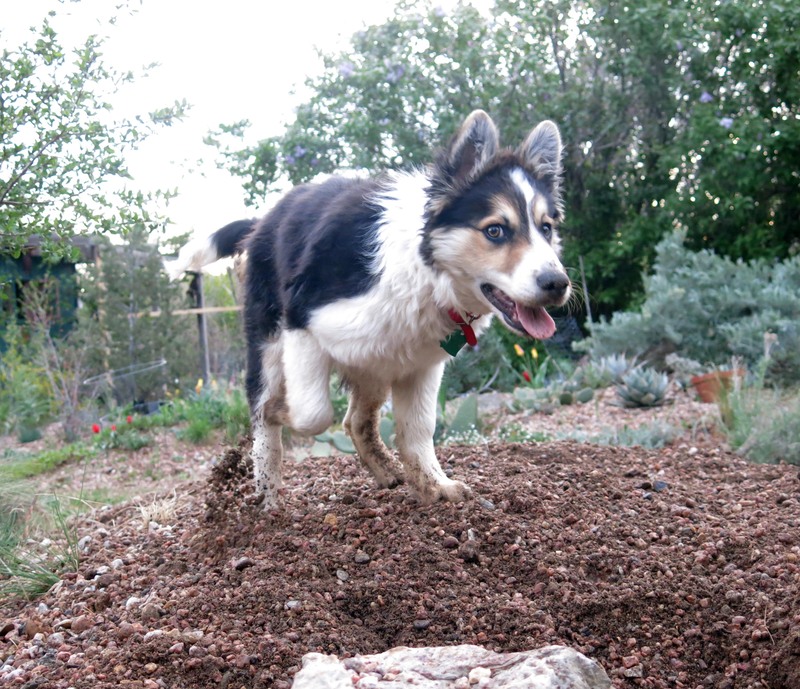 Then the rain stopped, and I took the opportunity to play in the pile of gravel I talked about earlier. The guy I live with yelled at me, in that high voice, which makes him look and sound completely ridiculous, but finally he just gave up, which makes me wonder why he yelled in the first place. Oh, by the way, he did fix my collar this evening. Looped the collar into the loop, I mean. Remember that I was already soaking wet. The guy I live with did try to dry me off with a towel, but I attacked the towel. That whole business was totally excellent. 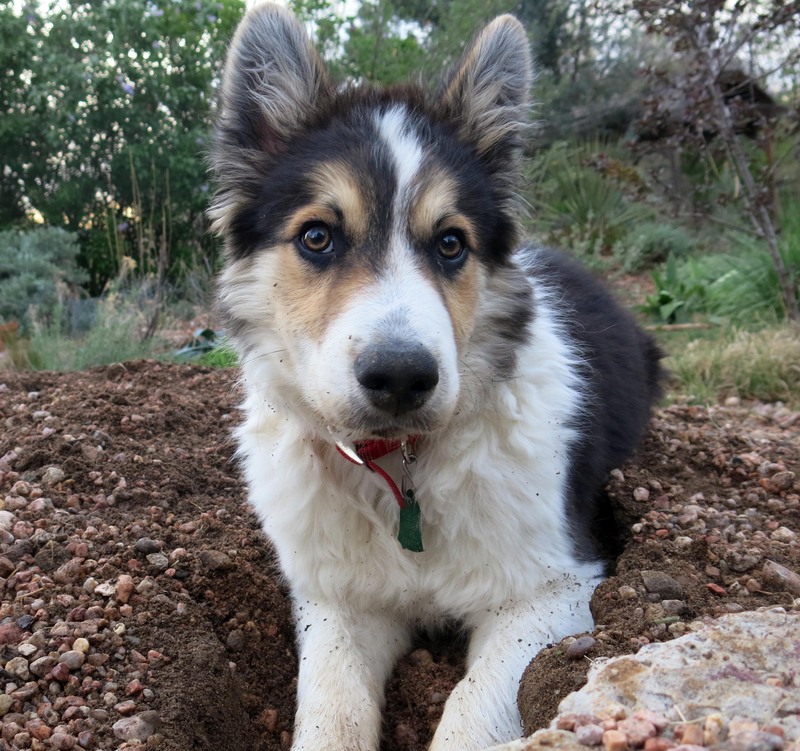 I bet the guy I live with fills in the trench I dug tomorrow, and so I can re-dig it to my heart’s content. I think that’s probably it for today. It was certainly more than enough for the guy I live with. I’ve been enjoying catching flies, which I know is an important part of my household duties, but the guy I live with completely freaked out today when I tried to catch a really big fly, which he said was a “bumblebee” and not a fly, and he got mad when I lunged at it after he told me not to, because I’m fairly sure he doesn’t know much of anything, but the huge fly flew away. He said I was exhausting to live with. I was so dirty after all my adventures today that the guy I live with threatened to give me a bath and stuff like that. I knew that was an idle threat. I much prefer to be able to blend into things anyway, as maybe you can tell. Thanks; the guy I live with claims that eventually the pile of gravel will have plants in it. Want to bet for how long? Cuteness will only take you so far my friend. I guess we’ll see how far, huh? “The Deconstructed Garden”. Title of our next book. However, he says he has been through this before. 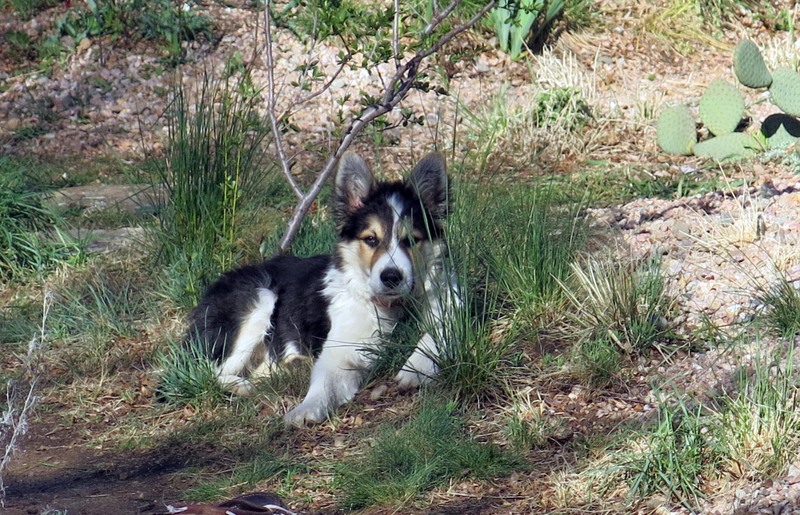 He claims that eventually I’ll learn to stick to the paths and that the lawn in back is, in fact, my Private Lawn. 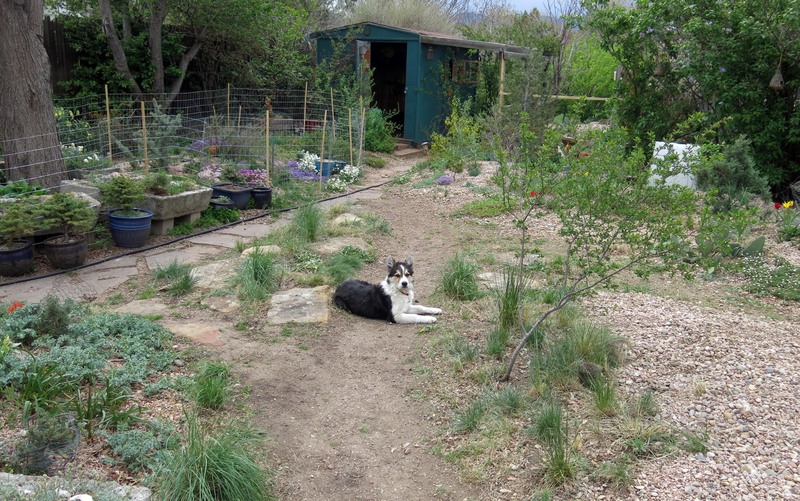 One fierce garden, and one fierce lounging-in-it doggie. Wish I had been there for the towel tug fight. Finally a pic of you smiling! Really, the fence is okay. Duh duh duh, waiting for the layers of dirt and gravel to be planted. Betting mayhem will ensue. Thanks, but no planting will be done on the gravel mound “probably for months”, until it’s fencified. Circumvallated. You know. Oh…the face of an angel. Obviously Mani you are a kinetic garden ornament—not the sitting still and just looking-good kind. 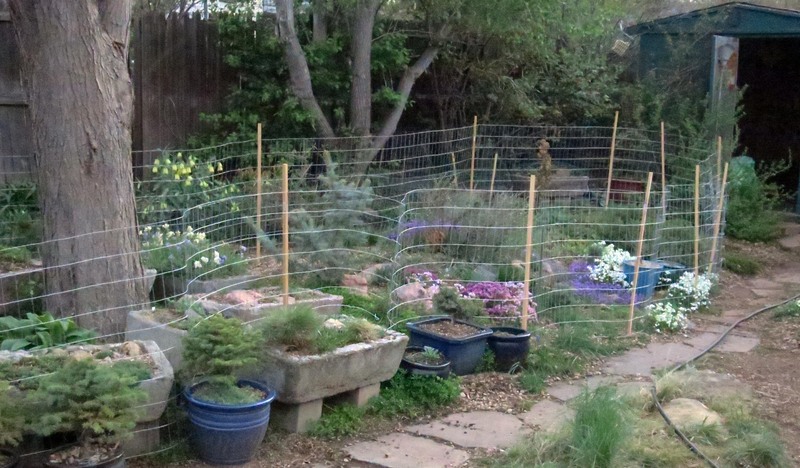 I envision a fence around the pea gravel pile in the future. You are definitely the precocious (if not adorable) gardener. Well, on the good side TGYLW has a free source of soil aeration. As for those big fuzzy flies, my dog seems to continually go after them despite getting stung various times. I don’t know how she does it or how they seem to find each other. It’s not like I invite bees into my truck, ect. Thanks, yes, the face of an angel. I better print that out to remind a certain party, when I do something he doesn’t care for. The guy I live with says that if I ate a bumblebee I might get a serious buzz. What’s that old saying? Bloom Where You Are Planted? Mani, I can see that that’s all you’re trying to do, as an embiggening border collie pure bred with rainy-day lounging and keeping-busy genes. Just trying to plant your self and bloom. Literally. Because there’s nothing metaphorical about the pure bred border collie mind. Thanks; yes, we are quite literal-minded indeed. Like, when I have things to do, I have things to do, if you know what I mean. They have to be done, no matter how much yelling and gesticulating goes on. It looks like Mani is starting to practice “The Eye” that border collies are so famous for. Sure to be a romping good time over the next year. Enjoy. Indeed, the guy I live with is much more practiced using The Eye, and so, for now, I lose staring contests. For now. Has TGYLW read Carol Price’s recent book? There are snippets on the net. Wish there was an equivilent for giant’s other than the generic schutzhund tomes. No, he hasn’t. He claims to be an “expert on border collies”. We’ll see, huh. I could look at you “blending in” all day, Mani. Someday Mt. Zot won’t be enclosed (though really the fence isn’t *quite* as ugly as TGYLW says). In the meantime, you are a glorious ornament. Thanks; I do rather feel like a Glorious Ornament. It’s raining here. Really, genuinely, one-hundred-percently raining. So I’m staying inside, with a good book.